Today my son Mark and I have spent our time around central Hanoi, a frantic cacophony of horns, motorcycles, cars and people. I’ve almost managed to accept the chaos now and am finding it a pretty fascinating place. The street vendors are not as much, in your face, as other places I’ve visited, but the shops and sheer mass of humanity, with many people living their lives on the roadside make for an interesting visit. I’ve done a couple of sketches and had a fair bit of interest from locals and other tourists. While sitting by Joan Kiem lake drawing I made a friend, Jack, who borrowed my pad for a few minutes. 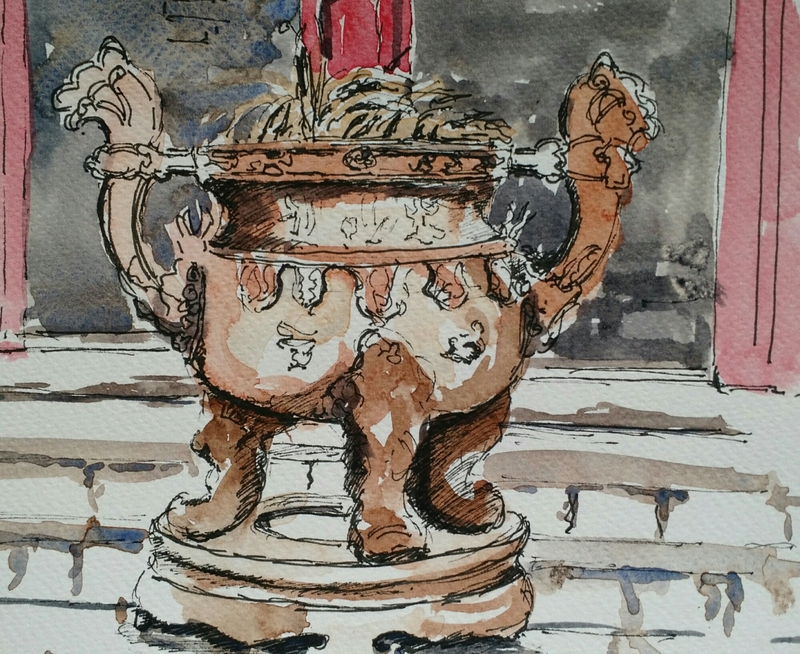 The sketch is of a giant incense burner at the temple on the island in the lake. This evening we headed out to a performance at the Hanoi Opera House. The show took a look at traditional Vietnamese culture but was predominantly a Cirque de Soliel style show performed around and on top of giant bamboo poles including trapeze, contortionists, and an amazing percussion juggling act. It was an impressive show in a great, restored, French era building. It’s a pretty exciting place isn’t it.